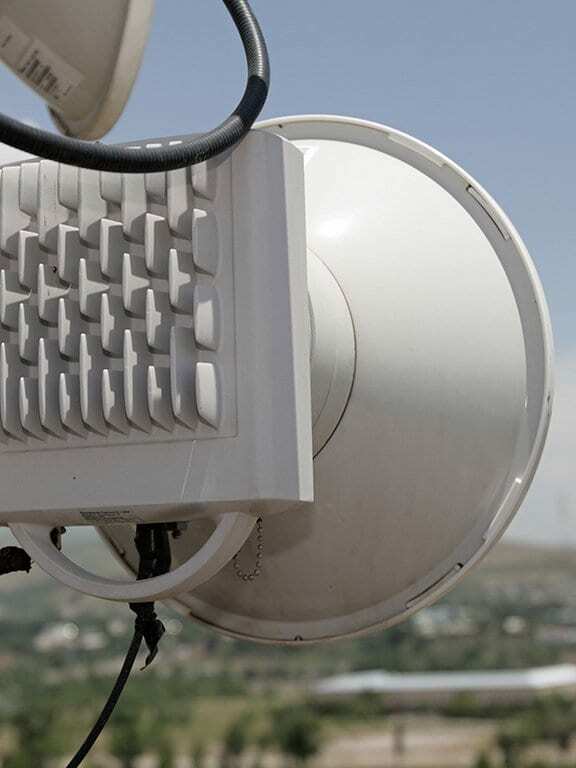 Microwave links provide a means of wireless communication between two or more buildings. This provides a cost-effective and convenient way to share Internet or Ethernet connectivity when a business occupies more than one building. Any business with multiple buildings should seriously consider either microwave RF links or free space optics to tie those buildings together under a common network connection. Sharing an Internet connection between buildings is nothing if not practical. There’s no reason for a business to pay for more than one Internet access point when a much cheaper alternative is available. Through microwave RF links, multiple buildings can share a single Internet connection, which helps to save money every month. However, where shared networking really shines is in one common Ethernet connection which supports a local area network, or LAN. There are myriad advantages to sharing a single LAN within a business, even when – or even especially when – the business is separated into multiple buildings. A local area network allows for a shared company database, so businesses can access important files and keep them updated in real time. For more information on the importance of LANs, please refer to the published article on LANs and Ethernet. Microwave RF links are also highly useful to transfer voice data, that is, telephone calls, between buildings in close proximity. A business which has extension lines to many different buildings may choose to use microwave links rather than physical cables to make a usable connection, which allows for more mobility and fewer installation woes. They can transfer video data as well, which facilitates simultaneous viewing of media within a business even if the viewers are in different locations. World War II by the British and became useful in radar systems. It was not until 1947 that Bell System first installed a microwave-based communications network, which grew rapidly: by 1960, microwave communications were responsible for carrying around 40% of Bell’s intercity traffic, and they only grew more popular thereafter. Currently, microwave technology is used to stream live television from great distances; improve the safety of airplanes; carry telephone calls; rapidly heat food; and perform various tasks which involve the transfer of electronic data. Of course, before opting to install microwave links in a building, one should be fully aware of the advantages and disadvantages of such a choice. The following information should be considered when deciding whether or not microwave RF links are the right decision. Reasonably high speed data transfer with good bandwidth and a long range. Highly susceptible to poor weather conditions, especially when moisture is present: fog, rain, mist, snow, clouds, et cetera may disrupt microwave communications. Requires a clear line of sight between buildings. Testing has shown that the amount of radiation produced by microwave RF links is extremely minimal – hardly more than that produced by a standard cell phone. No ill effects linked to the close proximity of microwave communications have been observed. Fibre optic cables and microwave RF links are both reasonably reliable mediums for transferring data. Both types of links offer high speed and bandwidth, good range, and the ability to transfer all types of data between different buildings. There are enough similarities between the two where it’s easy to be confused about which is more ideal.Overall, fibre optic links tend to be more reliable than microwave links over long distances since they aren’t susceptible to weather conditions. They do not require direct line of sight, either. However, fibre optic cables on the exterior of a building are an easy target for vandalism, and the installation of these cables requires more effort than simply mounting a pair of microwave satellites. The cost to purchase and maintain these links will depend on the circumstances under which they will be used.There are definite, if minor, differences in the functionality of microwave RF links versus fibre optic cables. To determine which one is ideal for a business, Active Communication Company Ltd recommends a free on-site survey. ACCL is a certified installer of CableFree and Geodesy laser link products.